Last night when it came time to feed the cats, I heard a knock on my door and thought it was my partner with a misplaced set of keys. But no! I opened the door and low and behold, there stood two young women in long-sleeved blouses and skirts that just covered their knees. Their teeth were very white and the smiles on their faces looked like a permanent feature. 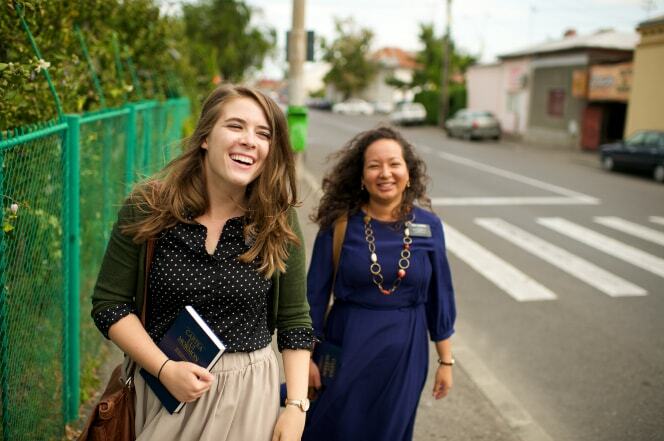 Even without the black nametags on their blouses, it was pretty obvious they were Mormon missionaries. This is not typical summer dress for the post-high school crowd where I live. Their eyes almost bugged out of their heads in shock. Huh, maybe they didn’t know who I was. Well, that’s a long story. I told them I would get them something to drink first and then tell them the rest. It was actually a really nice visit. When early on I said, “I think Mormonism is really cool, I just don’t believe any of it,” their eyes lit up hopefully, and I could tell they were about to launch into Alma 32: 28–43, which encourages people who don’t believe in the gospel to act as if they believed. The idea is that if you act as if, belief will grow into a real thing. Well, I had to preempt that. So I added that there’s the whole way that the church treats queer people, and how that makes the whole idea of rebaptizing a queery queer like me dead in the water. I could tell that didn’t completely quash their hopes, but the fire in their eyes went from a roar to a more sedate glow. They quizzed me about my background in Mormonism so they could gauge how much of a lost cause I was. We talked about the Book of Mormon and our favorite parts (I said I liked that it rejected the idea of original sin and how it treated Eve as a hero, not a pariah), about the missionary reality TV show The District, and a bit about my writing (alas, they aren’t allowed to read non-church publications while on their mission). And then, because I live in a neighborhood with a lot of Tibetan refugees and they had not been prepared for that, we talked a little about the Tibetan language, Tibetan Buddhism, the nearby monastery, and Tibetan throat singing, which you can sometimes hear when you walk through the neighborhood and people have their windows open. I think they realized I really was a lost cause when I talked about Tibetan Buddhism with almost the same level of enthusiasm as I earlier had for Mormonism. So they went on their way but told me to call them if I ever want to go to church or general conference, and I said to feel free to stop by if they were ever in the neighborhood and needed anything. And they didn’t ask to pray with me before they left! That was probably the best part. Like this? Visit the rest of my Mormon blog.